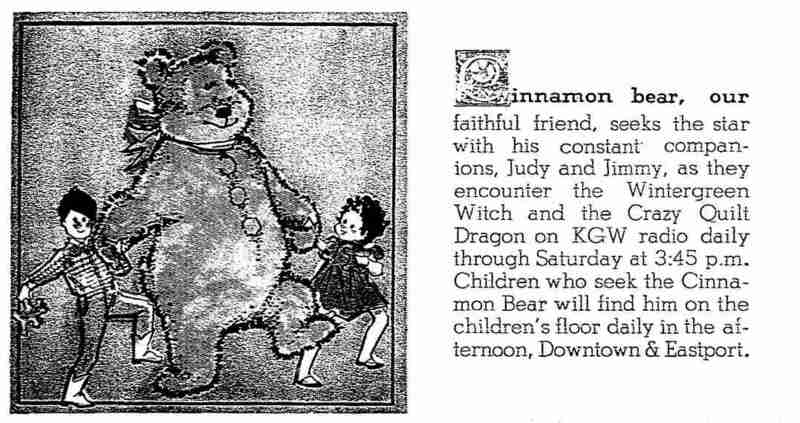 Airing for the first time in November 1937, a magical radio show about the adventures of The Cinnamon Bear filled the airwaves in the days before television. Each year, it became a ritual to listen to The Cinnamon Bear on the radio and count down the days to Christmas. 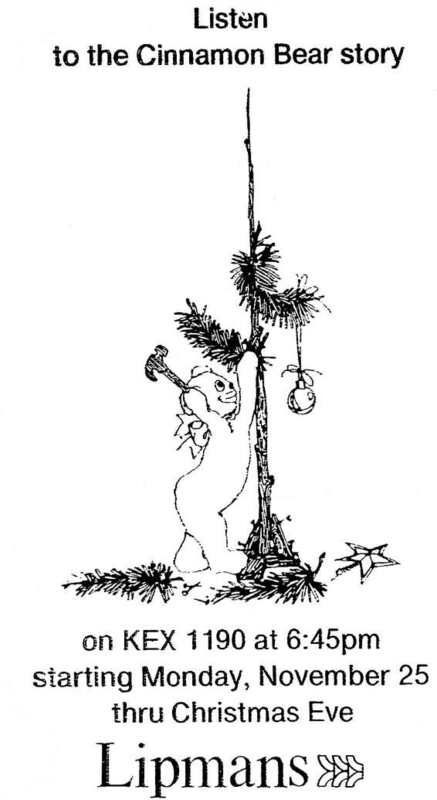 Judy and Jimmy (two of the nicest playmates you could want) were starting to decorate for Christmas and they discovered that the Silver Star for the Christmas Tree was missing. They went up to the attic to find it and met Paddy O’Cinnamon (The Cinnamon Bear), Santa’s right hand man. He tells them the star was taken to Maybeland by the wicked Crazy Quilt Dragon. 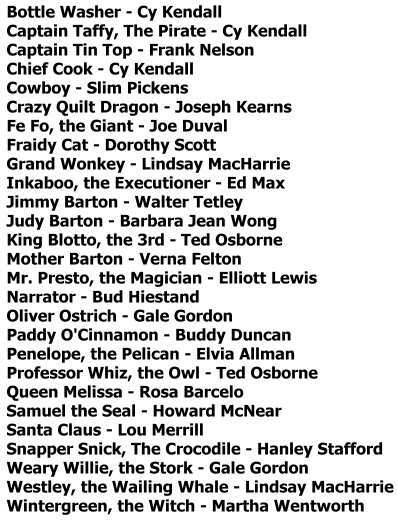 They all embark on a journey to find and retrieve the Silver Star and run into such characters as King Blotto, Willie the Stork and Captain Taffy and the Candy Pirates, among others. The Oregonian, Thursday Nov. 24, 1937. 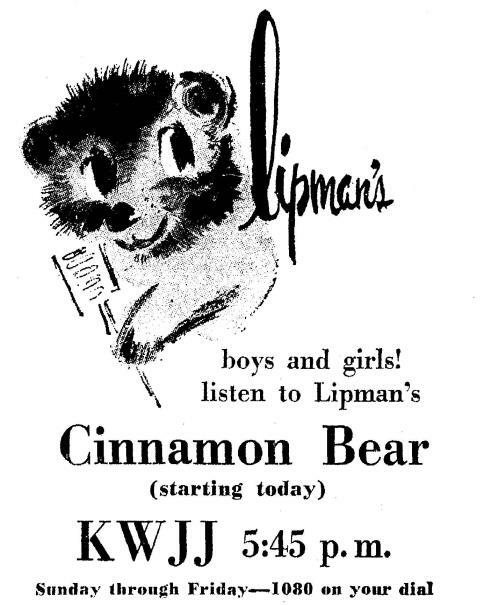 Lipman Wolfe’s sponsored the radio broadcasts in Portland, and the Cinnamon Bear took up residence at Lipman and Wolfe Stores at Christmas time. He would sit in the window and draw throngs of kids to the store so they could tell their parents what they wanted for Christmas, and if they were good, they might get to visit the Chocolate Lounge. 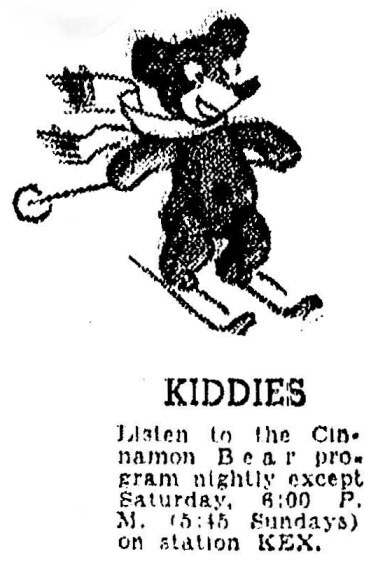 Portland's long association with The Cinnamon Bear began on a radio serial program 73 years ago. 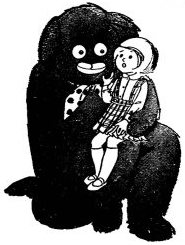 The Cinnamon Bear was created and written in 1937 by Glanville "Glan" & his wife Elizabeth Heisch for "Transco" Productions in Hollywood. Glan was working as a radio writer and director at KFI in Los Angeles, and the idea for the Christmas radio series came from Lindsay MacHarrie, Transco's Production Manager. The Oregonian, Thursday Dec. 9, 1937. The meeting of Glan & Lindsay happened by chance on Hollywood Boulevard. Lindsay invited Glan to lunch and explained his idea of a holiday season syndicated series written in a “cliffhanger” style "with all the charm and whimsy of the Wizard of Oz and Alice In Wonderland." MacHarrie wanted the series to air between Thanksgiving and Christmas with Santa Claus playing an important role. The Oregonian, Thursday Nov. 24, 1938. The serial was written in six weeks. including 11 original songs. The program was purchased mostly by department stores, but in Los Angeles, he was sponsored by the Downtown Merchants Association. There were twenty-six programs in the series, designed to be broadcast six times a week between Thanksgiving and Christmas Day. The feature carried with it elaborate processed window display cutouts in brilliant colors, songs from the program published in sheet music form for sponsor giveaways, together with many promotional and publicity ideas. It is believed that The Cinnamon Bear was recorded at "Radio Recorders" at 7000 Santa Monica Boulevard in Hollywood. The studio would later be used for recording many artists including Elvis, before becoming "Studio 56". 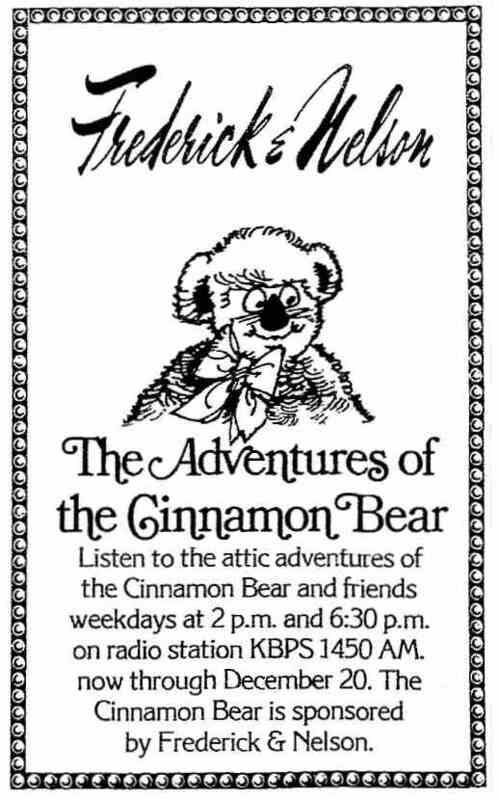 The Cinnamon Bear program was narrated by Bud Hiestand. Songs were composed by Don Honrath, with lyrics by Glanville Heisch. Music was conducted by Felix Mills. Vocals were sung by The Paul Taylor Quartet. The Cinnamon Bear was Produced by Lindsay MacHarrie for Transco. The Cinnamon Bear program was pressed and distributed by "Radio Transcription Co. of America Ltd." based at the old Columbia Records West Coast pressing plant at 1509 N. Vine Street in Hollywood. The Cinnamon Bear was pressed on standard 16-inch transcription discs. Radio stations received a Cinnamon Bear 12-inch promotional disc to play preceding the program. 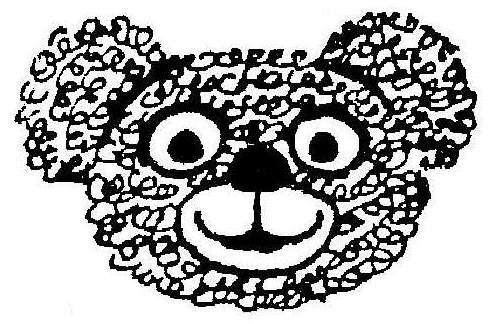 The colored record label featured a drawing of The Cinnamon Bear. 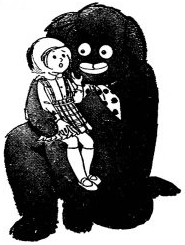 The national debut date for The Cinnamon Bear was November 29, 1937; however, since the program was syndicated, radio stations had the opportunity to begin airing the series on any day. 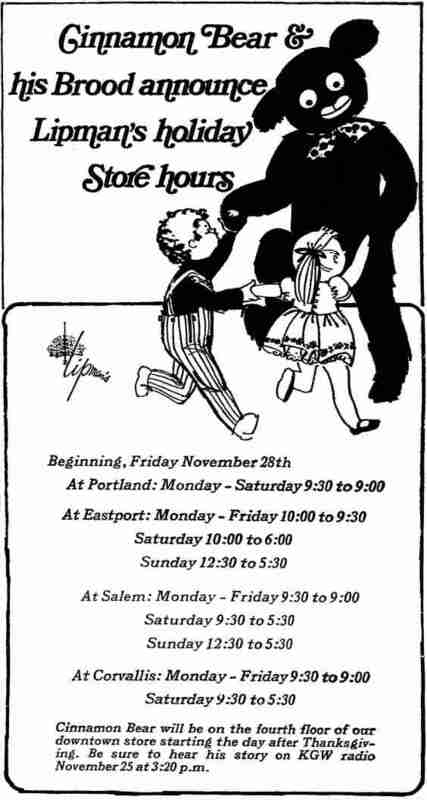 In Portland, The Cinnamon Bear debuted on November 25, 1937 on KALE. 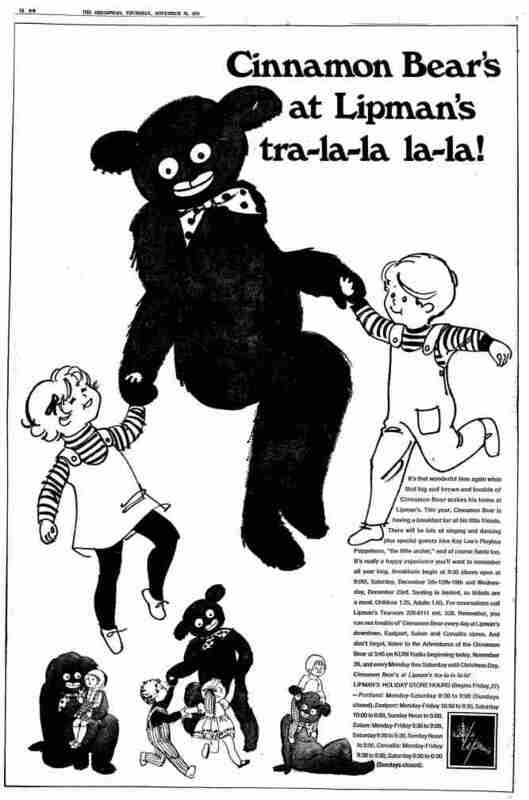 The Cinnamon Bear aired again in 1938 and 1939, but financial problems at Transco Productions in 1940 forced The Cinnamon Bear program to be taken out of syndication and it did not air that year. 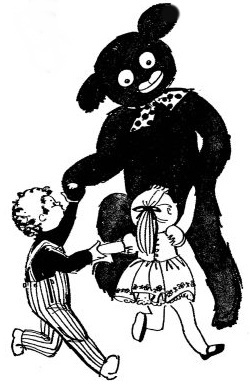 In 1941, Transco was sold to Broadcasters Program Syndicate and the Cinnamon Bear was back on the air. 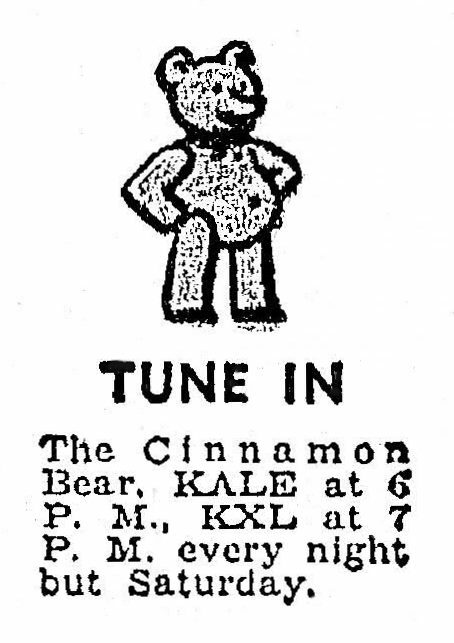 The Cinnamon Bear did not air in Portland in 1957, 1958, 1959, 1961, 1975 and 1978. The Sunday Oregonian, Nov. 30, 1941. The Sunday Oregonian, Nov. 27, 1949. The Sunday Oregonian, Nov. 25, 1951. The Oregonian, Monday Nov. 28, 1955. 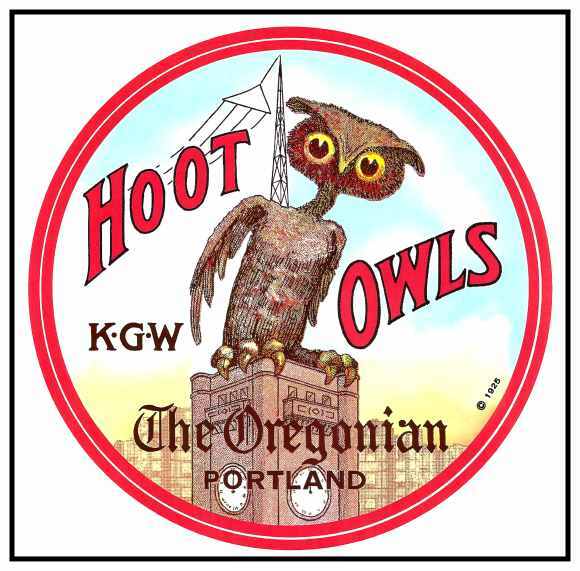 The Sunday Oregonian, Nov. 25, 1956. The Sunday Oregonian, Nov. 17, 1963. The Oregonian, Thursday Nov. 23, 1967. The Oregonian, Monday Nov. 25, 1968. The Oregonian, Thursday Nov. 27, 1969. 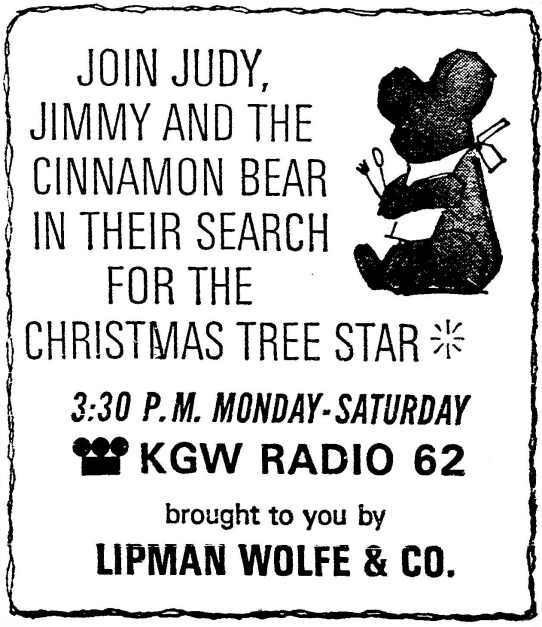 The Oregonian, Thursday Nov. 25, 1965. The Oregonian, Thursday Nov. 26, 1970. The Oregonian, Thursday Nov. 25, 1971. The Sunday Oregonian, Nov. 24, 1974. The Oregonian, Thursday Nov. 25, 1973. The Sunday Oregonian, Nov. 27, 1977. 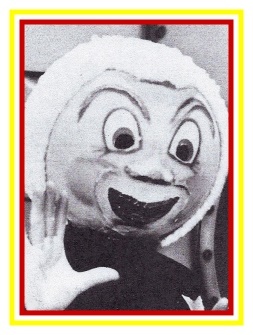 The Oregonian, Tuesday Dec. 4, 1979. 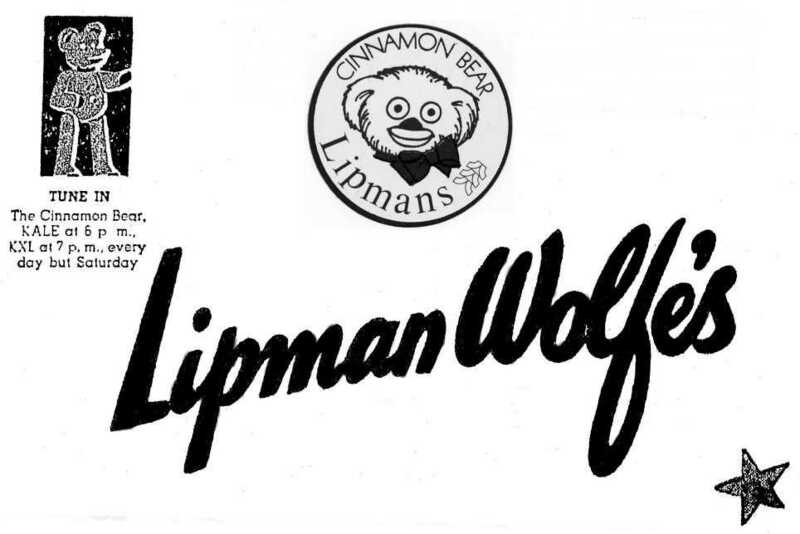 In 1978, Lipman’s was struggling financially and did not sponsor any broadcasts of The Cinnamon Bear. Lipman’s was purchased by Marshall Field’s and they were branded as part of Seattle-based Frederick & Nelson. Placing a Cinnamon Bear in many of their stores alongside Santa to give out cookies, Frederick & Nelson picked up the costs for broadcasting the series. 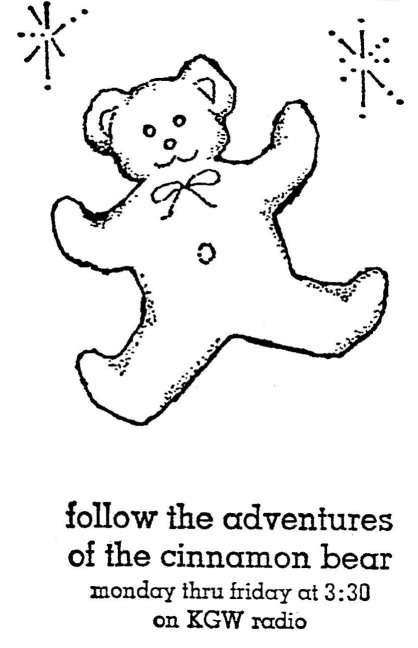 In 1979, Frederick & Nelson ordered 11,000 dozen cookies for The Cinnamon Bear to hand out over the holidays. He also visited children in hospitals when he wasn’t in the stores. Frederick & Nelson closed its last Oregon store in 1990. After 101 years in business Frederick & Nelson went bankrupt in 1992, but that wasn’t the end for The Cinnamon Bear. 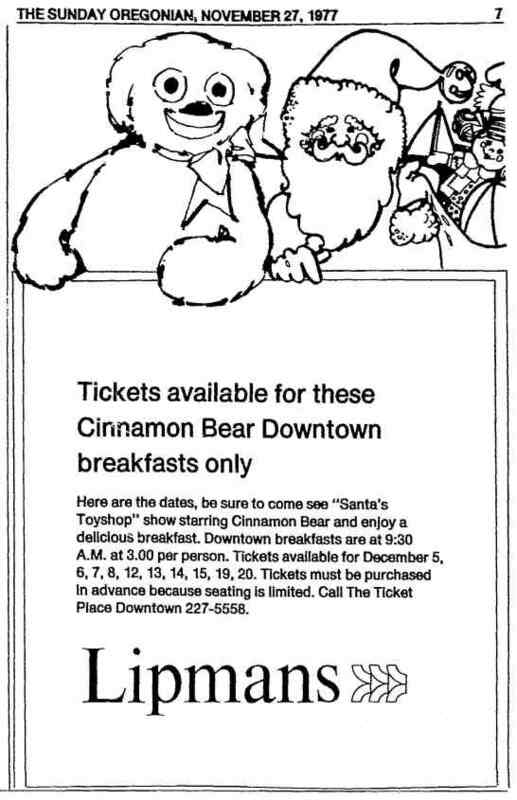 Many people who grew up here think The Cinnamon Bear is an Oregon creation, but he is actually part of Christmas in such places as Los Angeles, Sacramento, Spokane and Murray, Kentucky, according to Gene Kellenberger of Nostalgia Broadcasting of Cedar Rapids, Iowa, which syndicates The Cinnamon Bear program. Kellenberger said there was hope the Bear would go nationwide as a feature on National Public Radio, but the plan fell through. In recent years there has been talk of a Cinnamon Bear animated movie or a television special. The Cinnamon Bear still airs on the radio every year at Christmas as the tradition is passed on to future generations. 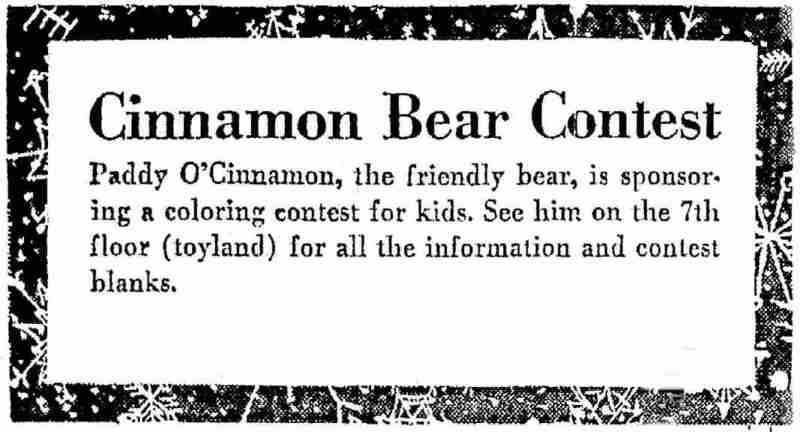 Thanks to Radio Historian Craig Adams for finding and retrieving the ads for The Cinnamon Bear and for many hours of research. 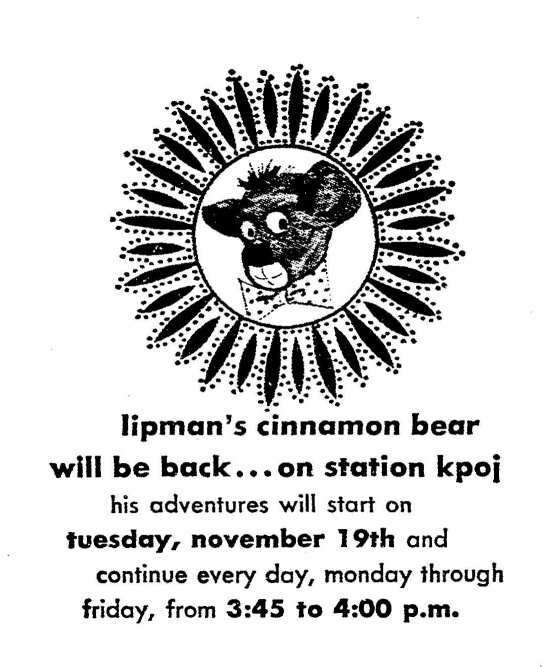 The Cinnamon Bear airs on KBPS at 10 am and 6 pm beginning Dec. 1. Catch up with The Cinnamon Bear on The Portland Spirit in December.